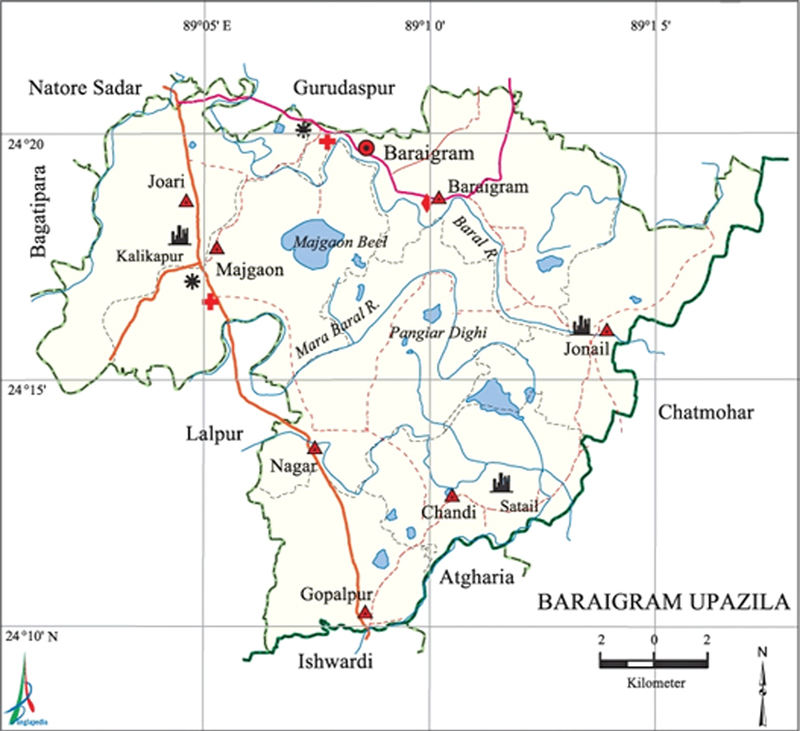 Baraigram Upazila (Natore district) area 299.61 sq km, located in between 24°10’ and 24°21’ north latitudes and in between 88°01’ and 89°17’ east longitudes. It is bounded by Gurudaspur and Natore Sadar upazilas on the north, Atgharia and Ishwardi upazilas on the south, Chatmohar upazila on the east, Lalpur and Bagatipara upazilas on the west. Population Total 244821; male 125399, female 119422; Muslim 228205, Hindu 10296, Buddhist 6290, Christian 13 and others 17. Indigenous communities such as Pahari, Munda, Oraon, Mahato belong to this upazila. Water bodies Main rivers: baral, Nandakuja, Khalsadanga and Mara Baral; Majgaon beel and Pangiar dighi are notable. Administration Baraigram Thana was formed in 1869 and it was turned into an upazila in 1983. Archaeological heritage and relics: Ancient copper plate in Nagar Union (415-455), ancient statue of Parnasharbari, Mughal fort, Kali Mandir (temple), Durga Mandir and Shiva Mandir (BS. 1212) in Joari Union, ancient Joykali Mandir at Haroa, ancient mosque (Nawabi period) at Ahmadpur, old Zaminder Bari and Shiva Mandir in Baraigram Union, Dargah of Sona Pir at Noabari, Santoil palace in Chandi Union, old Gunaihati Mosque and French stone inscription in Majgaon Union. History of the War of Liberation: During the war of liberation the Pak army brutally killed 85 innocent persons at Banpara Mission Refugee Camp on 3 May 1971. Marks of the War of Liberation Mass grave 1, martyr memorial 1. Religious institutions Mosque 274, temple 8, church 4. Baraigram Degree College (1970), Banpara Degree College (1985), Rajapur Degree College (1995), Moukhara Mahila Degree College (1996), Banpara Agricultural and Technical College (2000), Baraigram Pilot High School (1954), Rajapur High School (1954), St. Louis High School (1959), St. Joseph High School (1963), Ahmadpur MH High School (1985), Dasgram Siddikiya Alia Madrasa (1945), Dhanaidha Fazil Madrasa (1957). Cultural organizations: Library 2, press club 1, club 53, cinema hall 3. Main sources of income: Agriculture 73.70%, non-agricultural labourer 2.72%, commerce 9.31%, transport and communication 3.58%, industry 1.03%, service 4.40%, construction 0.72%, religious service 0.13%, rent and remittance 0.32% and others 4.09%. Ownership of agricultural land: Landowner 57.72%, landless 42.28%; agricultural landowner: urban 46.43% and rural 58.60%. Main crops: Paddy, sugarcane, wheat, mustard seed, turmeric, vegetables. Extinct or nearly extinct crops: Sweet potato, kaun, barley, peanut. Main fruits: Mango, jackfruit, litchi, banana, papaya, guava. Communication facilities Roads: pucca road 105 km, semi-pucca road 10 km, mud road 610 km. Extinct or nearly extinct traditional transport: Palanquin, bullock cart, buffalo cart, horse carriage. Noted manufactories Ice factory, rice mill. Cottage industries: Goldsmith, silversmith, blacksmith, potteries, weaving, nakshi kantha, bamboo work, cane work, woodworks. Hats, bazars and fairs: Hats and bazars are 18, fairs 7, most noted of which are Moukhara Bazar, Banpara Bazar, Marrygachha Hat, Rajapur Hat, Janitala Baruni and Gangaschan Mela, Laksmikol Charak and Dashami Mela, Nagar and Dhanaidah Chaitra Sangkranti Charak Mela, Darikushi and Jonail Paush Mela and Banpara Bhaishakhi Mela. Main exports: Paddy, banana, papaya, date molasses. Access to electricity: All the unions of the upazila are under rural electrification net-work. However 21.27 dwellings have access to electricity. Sources of drinking water: Tube-well 92.13%, pond 0.10%, tap 0.28% and others 7.49%.